San Francisco is one of my favorite cities to visit, and although I've been there a few times, I've never had enough money to stay for more than a day at a time. Sometimes traveling on a tight budget isn't always that great. However, I have managed to walk around that city quite a bit, but it would have been better had I had a book like this one to plan ahead, and to find out where the walks were. San Francisco is a smallish city and perfect for sightseeing on foot, provided you haven't chosen to see too many sights that require trudging up and down the famous hills. (Use the excellent transport system wherever necessary!) This compact and informative book offers a substantial amount of historical information about the city, the buildings, and the architecture. These walks include among others, the Financial District; the Waterfront; Chinatown; Russian Hill; Japantown; Postcard Row, and of course, Haight-Ashbury. 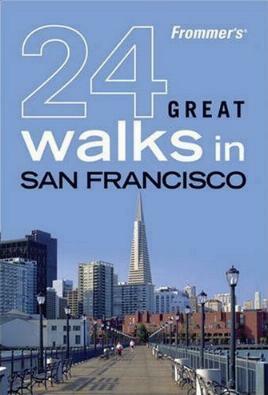 The walks are anywhere between 1 hour and half a day long, and between 1 and 4 miles in distance. For each tour there is a map with the route and numbered points of interest. I particularly like that there are buildings (I love architecture) to see as well as to learn about the notables who were around at the time. There are also a few restaurant options listed along each walk - walking and sightseeing is hungry work. There are great photographs throughout the book as well. I've always been a walker of cities, and have walked the other cities in this series of books (New York, Paris, Rome, and London), and I look forward to reading about other places of interest to walk around. Conclusion - Extremely interesting and invaluable to those of us who love to walk cities.